Fall is the best time of year for lawn care. The cool weather and regular rainfall in most areas of the United States helps lawns thicken up quickly after putting down fertilizer or renovating a lawn by overseeding it. Perennial weeds are easier to eradicate at this time of year and the soil will suffer less damage from dethatching or aerification equipment than it would in the early spring when it still retains its winter moisture. Fall is the best time to fertilize lawns, according to the University of Illinois Extension. Fertilize in early autumn with a regular lawn fertilizer such as 21-7-14 or 32-8-16, from late August through late September, depending on your location. In mid to late fall, fertilize your lawn with a fertilizer for winterizing anytime from mid October to late November, depending on your latitude. Because they are in active growth at this time of year, perennial weeds are best controlled with an application of herbicide in autumn. It is also important to kill these weeds before their seeds for next year's crop ripen and fall. Use a selective broad leaf herbicide to kill off perennial weeds like dandelions and clover. These weeds prepare for winter by sending nutrients down to their roots, which also works to effectively draw weed killer into their roots and kill them. The cooler fall weather, along with its abundant rainfall, is the best time for overseeding or restoring an existing lawn. Time the sowing of grass seed to give the new grass plants four to six weeks to get established before freezing weather sets in. In most locations this means plant grass seed from late August through late September. Lawns growing on heavily compacted soil or heavy clay soil benefit from aerification in autumn. This is done with an aerifier, a machine that removes plugs of soil and deposits them on the surface of the lawn. The benefits of this are twofold: The resulting holes allow air, moisture and nutrients to more easily enter the root zone of the grass, and the plugs left on the surface eventually break down and improve the soil on the surface. Aerification should be done in early to mid fall, allowing a few weeks for the “plugs” to break up before freezing weather sets in for the winter. Best done in the cool autumn temperatures, dethatching is the process of removing the layer of dried grass clippings and roots that lies on top of the soil, between the roots and the top growth of grass plants. If the layer of thatch in your lawn is more than 3/4 inch thick, it should be dethatched with a rented dethatching machine. The machine uses thick tines to break up the layer of thatch, which is then raked up and removed. Top dress the newly dethatched lawn with a 1/8-inch layer of topsoil or compost, which adds additional microorganisms that help thatch decompose. Continue mowing your lawn in autumn as long as the blades of grass continue to grow. Set the mower about 1/2 inch to 1 inch lower than you did when mowing the grass during the heat of summer. 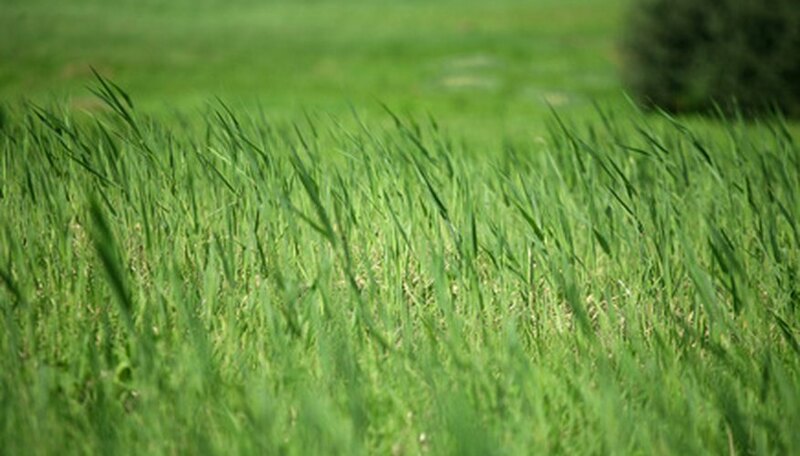 Regular mowing will also help prevent any remaining perennial weeds from setting seeds that will germinate and grow the following spring.